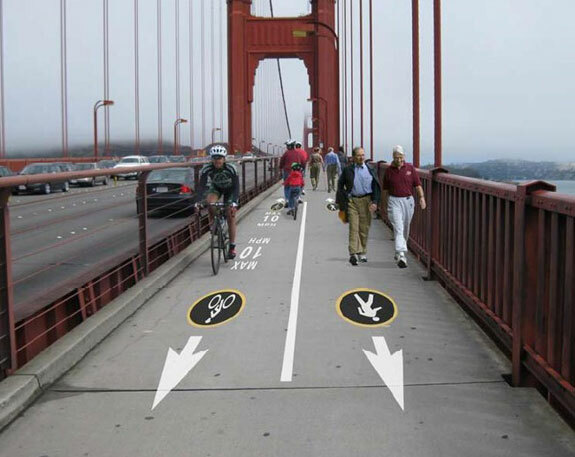 The Golden Gate Bridge staff wants to impose a 10 mph speed limit on bicyclists – with a $100 fine for violators – following a year-long study that excluded input from local cycling groups. The speed limit would drop to 5 mph around the blind corners of the bridge’s towers and in construction areas. There currently is no speed limit for bicycles on the bridge. The plan is intended to reduce bike-related collisions. With up to 6,000 cyclists using the bridge on busy days, the study says speed was cited as a factor in 64 crashes during the decade from 2000 to 2009. The other 101 bike crashes during that time were attributed to causes like inexperience. The proposal is likely to spark controversy among cyclists, in part because the speed limit is 15 mph on almost all other bike paths in the San Francisco Bay Area. The plan will be discussed at 10 a.m. tomorrow at a public meeting of the bridge’s Building and Operations Committee at the bridge toll plaza. If approved by the committee, the bridge district board would take up the matter on May 13. According to the study, most crashes occurred on the bridge’s bike-only west side, where the average speed of cyclists was estimated at 10-13 mph on flat portions and 13-17 mph on the downhill areas. Those speeds would put most cyclists in violation of the proposed limits. The report said the greatest “potential” for crashes involved experienced “road cyclists” who, on average, cruise at 17 mph on the uphills, 20 mph on the flats and 23 mph on the downhills of the bridge’s western sidewalks. However, the report doesn’t say whether this group, which makes up about 10 percent of all cyclists, was actually involved in more crashes. Nor does it break out the number of crashes involving tourists on rental bikes. The speed limits would be enforced by bike-mounted California Highway Patrol officers, whose main goal is to reduce accidents, according to Officer Chris Rardin, a spokesperson for the CHP’s Marin office. Neither the bridge district nor the CHP would receive the revenue generated by the fines, according to both Rardin and bridge spokesperson Mary Currie. That money would go to either San Francisco or Marin counties, depending on where the ticket was issued. The plan also would create separate lanes for bikes and pedestrians on the east sidewalk. That could ease the mid-day congestion that, while frustrating to both groups, currently helps to minimize the number of serious accidents. “The congestion itself controls the bicycle speeds on the east sidewalk, and thus plays an important role in controlling the severity of injuries resulting from the bicycle accidents on the east sidewalk,” said the report, which was prepared by Alta Planning & Design. Alta Project Manager Brett Hondorp declined to answer any questions about the study, saying his firm had been ordered by the bridge district not to comment. According to the report, about 2,500 cyclists use the bridge on a weekday, including 600 who ride on the bike-only western sidewalk after it opens at 3:30 p.m. About 1,900 cyclists and 4,200 pedestrians share the eastern sidewalk on weekdays. An estimated 4,600 cyclists ride on the west side on weekend days, according to the study. And the total of cyclists on the bridge soars to about 6,000 on the busiest days. Of the 165 total crashes, 51 percent occurred on the west side and 48 percent on the east side. It wasn’t specified where the other 1 percent occurred. There were 16 head-on crashes on the west side, with just one resulting in serious injuries, in 2005, the staff said. The idea of a speed limit came up twice before, in 2000 and 2003. It was rejected both times, partly because speed “did not appear to be a dominant factor in the majority of bicycle incidents” and partly because neither the bridge district nor the CHP wanted to assume responsibility for enforcement, according to a staff summary. At those times, the district worked with the local cycling groups and bike rental companies to develop safe-riding guidelines. 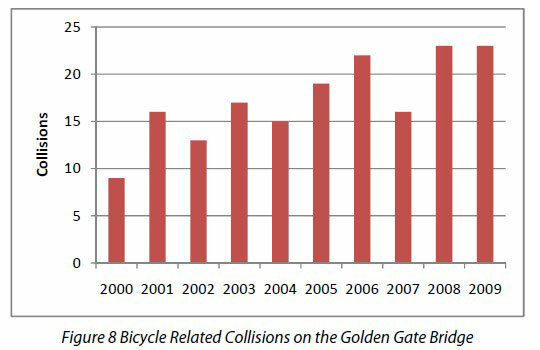 The accident rate has risen slightly since then “as the number of bicyclists using the bridge rapidly has increased,” a staff report said. Currie said local bike groups will have an opportunity to comment on the proposals, now that the district’s study is complete. Alta, the consulting group, worked only with other public agencies in preparing the data, she said, although several out-of-state cycling and transportation groups are cited among the report’s 30 references. Currie said the 10 mph speed limit was proposed in deference to the “configuration and geometry” of the bridge’s design. The main sidewalks are mostly 10 feet wide with clear sightlines, but narrow to as little as 5.5 feet near bridge pylons and 7.5 feet near the towers. Asked why the report doesn’t address solutions for the 61 percent of crashes that aren’t caused by speed, Currie acknowledged there is a “data gap” in the report. I attending the board meeting on this subject and Dennis Mulligan the GM said they (Alta) were specifically told to keep it confidential and not talk to bicycle coalition or clubs, etc. No explanation was given as to why. 15mph is the usual speed limit on mixed-use paths. No reason for this one to be any different. But I would like to see a center stripe to separate northbound and southbound traffic, especially around the towers. Encouraging everyone to stay to the right and to respect oncoming traffic is key. How is it possible that you don’t understand how inexperience causes crashes? Please explain your lack of understanding. That’s like saying you don’t understand why eating 4,000 calories a day and not working out leads to obesity. There’s a reason why people study, practice, and prepare for things that they do – believe it or not, it makes them better at doing that thing. Riding a bike on the bridge is the same. Even as an experienced cyclist, I remember feeling uneasy about the wind, the height, etc. on my first ride across the bridge.